This brining solution I like because it has more flavor than salt. I have found with heavy salt brining approaches, if you don't rinse your turkey well enough, it will be slightly salty. This recipe counts on vegetable and chicken broths to add a lot of the salt and flavor. I used food grade brining bags, and had 2 18 lb. turkeys, in each bag. I divided the solution evenly amongst the two, and flipped the turkeys after 8 hours so each side gets brined evenly. I have heard people using plastic buckets or even garbage bags to brine turkeys. I would caution you to make sure whatever you brine your turkey in that it is food grade. Plastic chemicals can leach into your food and you don't want that-for the health of you and your guests. Also, the turkey still needs to be kept refrigerated while brining, so make sure whatever you use will fit in your fridge-or if it is cold enough, you could keep it outside or in a cold garage. The roasting recipe is on my sister site if you want it. 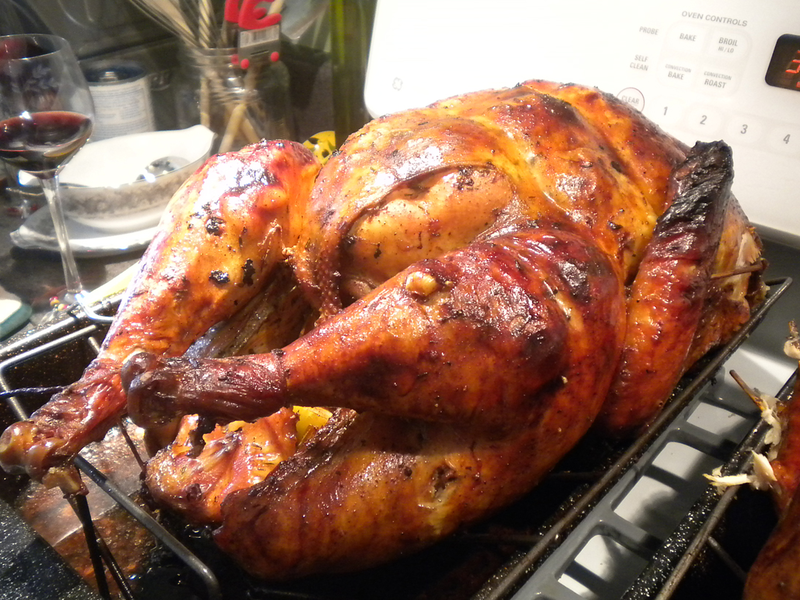 It is a delicious recipe, and this year, we had the turkey on convection first (breast side down) which gave the turkey a rich caramel color and seared it, than lowered it to 325˚ at "regular baking" after a couple hours of convection to slow roast. It worked out well. Also, keep in mind brining a turkey speeds up cooking time by about 20-30 minutes. Be sure to calculate that when you are timing things! Also, when cooking two turkeys together, calculate what it would take for one turkey, then add 50% more time to it. The mass of that much food in the oven slows down the cooking time, but not quite by double. That seems to work for us. In a very large stock pot, boil all the ingredients minus the water. Lower to simmer, and cook until salt is well dissolved. Take off the flame and let sit until cools to room temp. Divide evenly between both turkeys in each bag, add 1 gallon of ice water to each bag. Seal shut. Let sit in the refrigerator for 8 hours. Flip turkeys and let sit for another 5-8 hours. When ready, discard bags and broth and rinse turkeys well, pat dry. Dress and truss as you wish.